Buy Chuva a coffee. ko-fi.com/mrtiaa - Ko-fi ❤️ Where creators get paid by fans, with a 'Buy Me a Coffee' button. I'm tiaa and I draw stuff. I don't really drink coffee but it's a figure of speech and since the main character of my webcomic really digs some coffee, let's consider you are feeding him! Check my drawings at my twitter~ cheers!! He-hello...! I'm Chuva and Tiaa is currently telling up a story about me and my friends in webcomic format, you can lean more about it here: http://www.chuvareu.mr-tiaa.com/ . 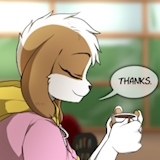 Thanks for consider buying me a coffee...! Secured Payments. Support goes to Chuva's account. Upgrade Chuva to a yearly Gold Membership with a one-time payment.